Electricians perform a variety of tasks on the electrical systems of buildings and other structures. Their responsibilities range from layout and planning of wiring to installation, troubleshooting and repair of circuits and electrical devices. Electricians typically work 40 hours per week and may occasionally work overtime. Workers are usually indoors, though the work area can often be noisy and dirty. Work may take place from heights or in confined spaces, and may require lifting of heavy objects. Safety is a big concern and precautions are followed to reduce the risks of injury from accidental electric shocks and falls from heights. Trade certification for this occupation is voluntary in B.C. However, an employer may require it. There are also electrical installation permit requirements with Technical Safety BC. Find more information at https://www.technicalsafetybc.ca/electrical/electrical-installation-permits. Interprovincial Standards Red Seal certification is available to qualified electricians through the Industry Training Authority. Workers with 9,000 hours of documented, directly related work experience can challenge the Interprovincial Red Seal examination. Demand for these workers depends largely on growth in the Construction industry. 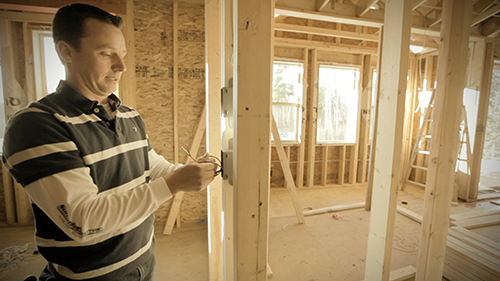 Over the last decade, low interest rates and a growing economy resulted in an increase in construction activity in B.C., which led to increased demand for electricians. Over the next few years, the pace of residential construction is expected to slow, while industrial construction is expected to remain stable. Demand for these workers will remain, despite the shift in construction activity. In general, those working as maintenance electricians tend to find more stable employment than construction electricians. Employment in the Construction industry is typically project-based, so workers may experience gaps in employment between projects. Work performed by electricians is expanding to include alternative energy supplies, such as solar power, wind power and fuel cells, wiring for smart homes and automated systems for high-tech industries and complex computer offices. Electricians who specialize in new technologies are expected to be in demand. As with many trades, apprentices are often chosen from a company's current employees, such as construction labourers. Experienced electricians can advance to supervisory positions as foremen, superintendents, estimators or electrical inspectors. Some experienced electricians may choose to start their own contracting businesses. Some electricians may also choose to work as industrial electricians. This requires further education and is generally considered to be a lateral change.